Tomato sauce is any of a very large number of sauces made primarily from tomatoes, usually to be served as part of a dish. 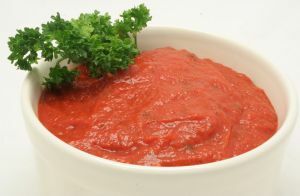 Tomato sauces are common for meat and vegetables, but they are perhaps best known as sauces for pasta dishes. Tomatoes have a rich flavor, high liquid content, very soft flesh which breaks down easily, and the right composition to thicken into a sauce when they are cooked. All of these qualities make them ideal for simple and appealing sauces. The simplest tomato sauces consist just of chopped tomato flesh cooked in a little olive oil and simmered until it loses its raw flavor, and seasoned with salt. Optionally tomato skins may be scalded and peeled according to texture and tomato seeds may be removed to avoid their bitterness. Water is sometimes added to keep it from drying out too much. Onion and garlic are almost always sweated or sautéed at the beginning before the tomato is added. Other seasonings typically include basil, oregano, parsley, and possibly some spicy red pepper or black pepper. Ground or chopped meat is also common. In countries such as Australia, New Zealand, South Africa and the United Kingdom, the term "tomato sauce" is used to describe a condiment similar to that known in the United States as 'ketchup'. In some of these countries, both terms are used for the condiment.